Printmaker Carol Moore draws on her love and close relationship with Nature to find the inspiration for her artwork. Please visit her website to see more of her beautiful artwork. All of the paths that I traveled in my artistic journey have led me to printmaking. As a child I spent endless hours outdoors playing and creating with nature. Years later, as a young adult, I became a graphic designer in the advertising field during the pre-desktop publishing days–everything was done by hand. Working by hand gave me keen technical skills and the patience for process. Likewise, the many visits back to the drawing board gave me the backbone I needed to be a Printmaker. When my children were young I worked part time as a Mural Painter. It was the creative freedom of this work that led me on the path towards the fine arts. I remembered how much I enjoyed the Intaglio course I took back in college. When my children were grown, I went back to school and took every printmaking course available. I have been working as a printmaker since 2010 and I think this road will be a long one–I’m hooked! Once again, I have found myself outdoors playing and creating with nature. I spend countless hours walking, observing and foraging for the specimens that inspire my work. It is very important to me that my art should stem directly from my personal experiences and relationships. This ownership ensures that I will be present in each image I create. I am particularly drawn to the repeating patterns in nature, those of our natural world and those found in our shared human experiences. Printmaking offers an extensive arsenal of tools and techniques that allow for endless experimentation and invention. I get lost in the details, getting up close and exposing overlooked textures and patterns, often re-purposing them in new, yet familiar ways. 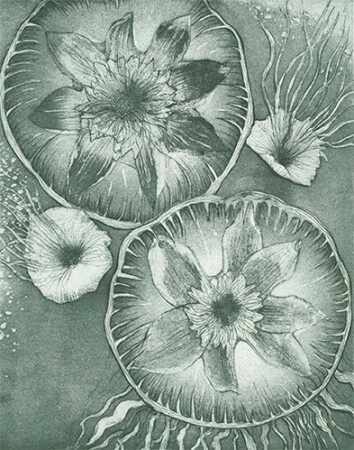 The many forms of printmaking appeal to me for different reasons; for instance, Intaglio allows me to get up close and render great detail and offers techniques that allow me to utilize the natural materials I often use in my work. Equally appealing is Lithography; I enjoy it because it is a sensitive technique by which I can draw directly onto a stone or plate. I can be very expressive and am attracted to the range of tones and the gorgeous blacks that can be produced with Lithography. Printmaking offers the perfect mix of art and science. I find the science fascinating, the chemicals, inks, modifiers and processes can sometimes bring surprising results. These surprises often lead me down unexpected paths that always teach me something new. I like that the craft is very physical; inking plates, operating presses, and rolling up slabs of ink are all a labor of love that bring me closer to my work. My current path as a Printmaker brings me great joy and allows me to celebrate my life experiences while further encouraging me to be an explorer and an inventor. I look forward to every twist and turn! Carol’s talent and art is a pleasure to behold, with rich variation and presentation!